Not to be confused with Blackheath, West Midlands. The Roman road that later became known as Watling Street crosses the northern edge of Blackheath (almost in line with the A2), probably heading for the mouth of Deptford Creek, rather than for Deptford Bridge like the modern A2. Before the development of Greenwich palace by the Tudors, one of the most frequently used royal palaces during the latter Plantagenet era was Eltham Palace located about 2.5 miles (4.0 km) to the southeast of the heath and Watling Street. It continued to be used as a royal residence to the 16th century. The sizeable estate of Blackheath Park, created on lands of Wricklemarsh Manor by John Cator is situated east of Blackheath, between Lee Road, Morden Road and Manor Way. Built over in the late 18th and early 19th centuries, it contains many fine examples of substantial Georgian and Victorian houses – most notably Michael Searles' crescent of semi-detached terrace houses linked by colonnades, The Paragon (c. 1793-1807) – as well as some 1930s and 1960s additions. The Cator Estate was built on part of the estate formerly owned by Sir John Morden, whose Morden College (1695) is another notable building to the south-east of the heath. The Cator Estate also contains innovative 1960s Span houses and flats, and the Blackheath High School buildings on Vanburgh Park include the Church Army Chapel. St Michael and All Angels' Church, designed by local architect George Smith and completed in 1830, was dubbed the Needle of Kent in honour of its tall, thin spire (it is also nicknamed the Devil's Pick or the Devil's Toothpick). All Saints' Church, situated on the heath, designed by the architect Benjamin Ferrey, dates from 1857. Another Anglican church, St John the Evangelist's, was designed in 1853 by Arthur Ashpitel. In the 18th century, Blackheath was the home of Greenwich Cricket Club and a venue for cricket matches. The earliest known senior match was Kent v London in August 1730. A contemporary newspaper report said "the Kentish champions would have lost their honours by being beat at one innings if time had permitted". The last recorded match was Kent v London in August 1769, Kent winning by 47 runs. However, Blackheath is perhaps most famous for founding the Blackheath Rugby Club in 1858, which is the oldest documented rugby club in England and was located until 2016 at Rectory Field on Charlton Road. The Blackheath club also organised the world's first rugby international (between England and Scotland in Edinburgh on 27 March 1871) and hosted the first international between England and Wales ten years later – the players meeting and getting changed at the Princess of Wales public house. Blackheath was one of the 12 founding members of the Football Association in 1863, as well as nearby Blackheath Proprietary School and Percival House (Blackheath). There is also a long history of kite flying on the heath. Growing popularity of the sport in recent years has attracted many kite flyers and kitebuggying has also appeared on the heath. Be Military Fit runs its evening classes on the heath during the winter months, when Greenwich Park is closed. There are two main clusters of amenities in Blackheath: the "Village" focused around Blackheath railway station to the south of the heath (in Lewisham), and the "Standard" to the north-east of the heath and the A2 road, named after the Royal Standard pub (in Greenwich). This area is also known as Westcombe Park. A small park in the centre of the Standard was originally a village green, known during the 18th century as Sheepgate Green, marking the intersection of four major roads. Around 1885 local philanthropist William Fox Batley had the green refurbished and it became known as Batley Green or Batley Park; Batley's contribution is recorded in an inscription on a memorial fountain. The area is served by Blackheath railway station with services to London Bridge, London Charing Cross, London Victoria, London Cannon Street, Slade Green via Bexleyheath, Dartford via Bexleyheath and via Woolwich Arsenal and to Gravesend via Bexleyheath. The previously direct service to the Medway towns was withdrawn in May 2018. 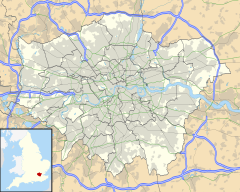 ^ "Blackheath Westcombe Demographics (Greenwich, England)". blackheath-westcombe.localstats.co.uk. Retrieved 13 October 2016. ^ "Area guide for Blackheath". ^ a b c Mills, A.D. (11 March 2010). Dictionary of London Place Names. Oxford. ISBN 978-0199566785. ^ Homan, Roger (1984). The Victorian Churches of Kent. Chichester: Phillimore & Co. Ltd. pp. 30–31. ISBN 0-85033-466-7. ^ "Our History: Royal Blackheath Golf Club - The Oldest Golf Club in the world". Royalblackheath.com via archive.org. Retrieved 15 July 2011. ^ Fries, Theodor Magnus; Jackson, Benjamin Daydon (2011). Linnaeus. Cambridge University Press. p. 158. ISBN 9781108037235. ^ Rimel, Diana (2006), "History of the Standard", Westcombe News, February 2006, p.6. Accessed: 20 July 2015. "Blackheath" . Encyclopædia Britannica (11th ed.). 1911. "Blackheath" . Encyclopedia Americana. 1920.